A variety of different colors and textures from quarries around the US. Includes 12″ Stainless Steel Ring and Gas Line. Featherock is variety of volcanic rock. Coloration is light to dark gray. 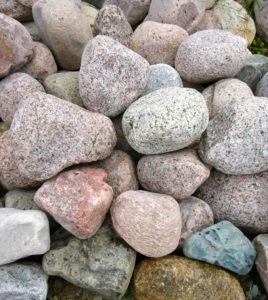 These boulders are very porous and lightweight. $.64/per lb. Weathered sandstone boulders. All sizes to choose from. Mossy appearance. Beautiful water features that serve as an excellent focal point for any home. The water is held below the boulder and is pumped through a drilled hole in the rock that rolls down the sides of the boulder. It creates a very tranquil and peaceful waterfall sound. Available in a variety of sizes and shapes. Liners, Basins and Pumps all sold separately. Available in a variety of sizes, generally rounded, some boulders have freshly broken faces revealing dramatic veining and colors. Commonly placed in garden ponds and streams. Available in red, gray, black and pink, range in weight from 50 to 6000 lbs. Very Colorful! A flat rounded river rock in multiple colors, gray, red, browns, greens and more. Colors stand out when rocks are wet. Useful in water features or any garden. Range in weight from 15 to 25 lbs. Mined in Wisconsin, giving these rocks beautiful deep color combinations. Primarily round, smooth granite pieces, with colors ranging from pink to green to gray. Also called river boulders. Make great accents to any garden bed, stream or pond design. Range in size from softballs to basketballs, weighting 10-20 lbs.